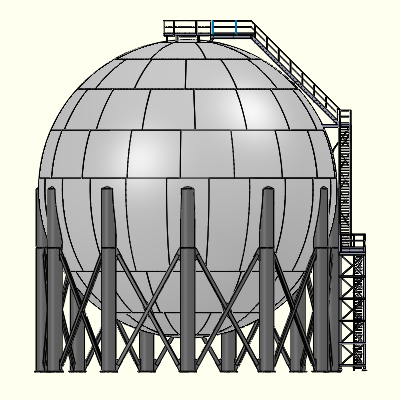 Pressure Vessel Engineering was hired to prepare calculations for both pressure containment and supports for wind and seismic loads on a series of large propane storage spheres for Conrex. 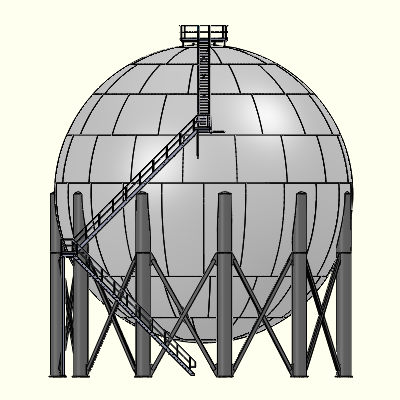 The vessel wall thickness and nozzle supports were calculated using standard ASME code calculations. 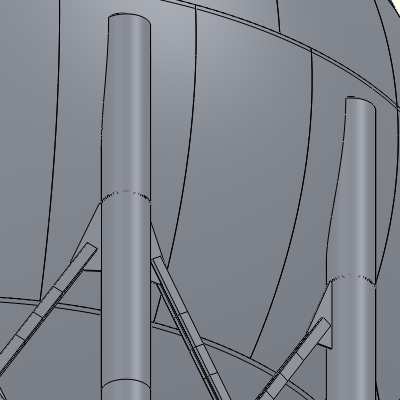 The vessels supports were constructed using industry standard designs but Finite Element Analysis (FEA) was used for the analysis instead of existing design rules. Shorter legs – the legs are still attached to the equator plates, but not as high up. The leg to foundation pitch circle is reduced resulting in shorter legs but increasing the overturning stresses on the legs. 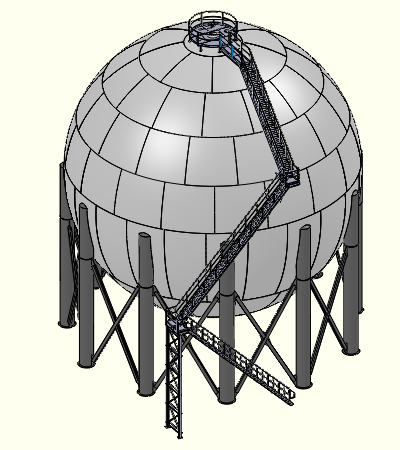 Larger legs at the shell attachment – The leg size at the top was increased until the vessel stresses at the attachment were reduced to an acceptable level. 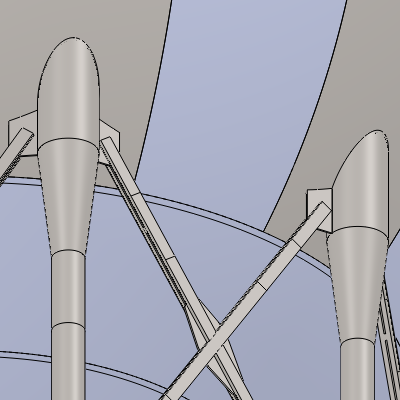 A conical transition was placed between the two different sizes of leg pipe. The reduced leg diameter at the bottom has a minimal cost impact so future production is likely to be based on a straight pipe from attachment to foundation based on the larger diameter. Rectangular tubing cross bracing – This high strength method of cross bracing was developed by Conrex and used in the production vessel. The bracing method shown here is identical. 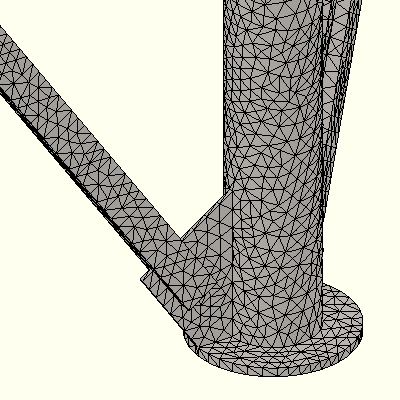 The appendix to the FEA report shows the excellent results obtained with this design feature. V plate location – for this experimental report the cross bracing leg v-plates were moved from the leg to directly attach to the shell. This design change reduces twisting at the shell attachment and is one of the keys to not requiring thicker equator plates. 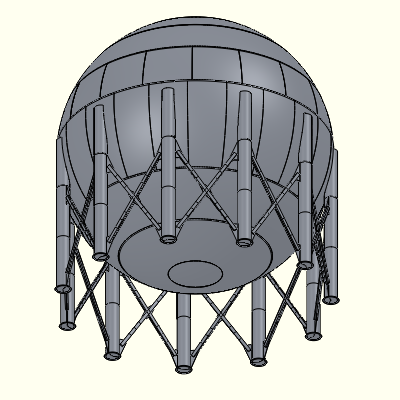 The v plates create local stresses in the shell which are acceptable in this experimental vessel, but could be further optimized if put into production. All dimensions and operating conditions of the original vessel were changed for this sample to protect Conrex’s customer’s process confidentiality. Some comments on the FEA are in order. At the time this report was first done in 2009, it was one of the largest models we had run. 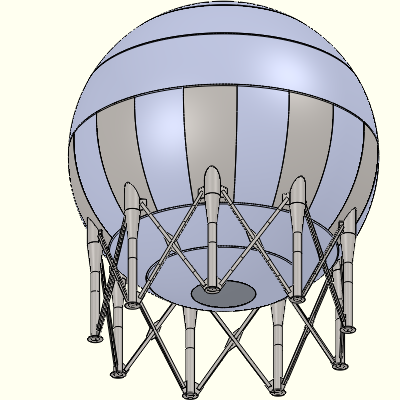 It was run entirely as solid elements which increased the mesh complexity but allowed the study of model details impossible if a shell mesh was used. 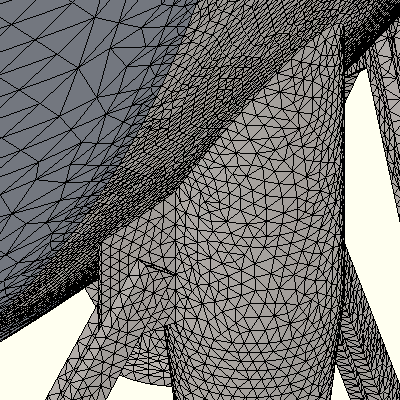 Although the model has more than 1/2 million elements and 1-1/2 million nodes, it meshes in less than 5 minutes and solves in an additional 5 minutes. This quick response time allowed rapid experimenting with different design alternatives. Clearly a half model could have also provided the same results with shorter run times, but some of the preliminary designs we analyzed did not have symmetrical leg supports which required the full model to check for side sway effects. The report shows the six load cases that were applied to the model to comply with ASME VIII-2 Table 5.3 requirements. The load cases were also based on Conrex’s field experience with hydro testing. Seismic and wind loads are from IBC 2009 for San Diego. Studying these loads by FEA provides a much greater insight into how a vessel reacts to these loads than is possible by using standard rule based design procedures. This does not invalidate the use of rule based design but allows one to go beyond the level of understanding available using them. This experimental design would not have been derived using rules based analysis. 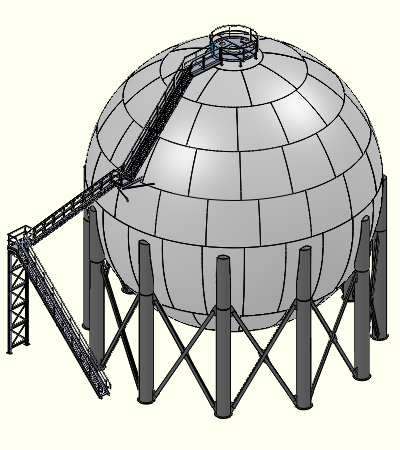 An ASME calculation report is included which covers the scope of the shell thickness and nozzle reinforcement. 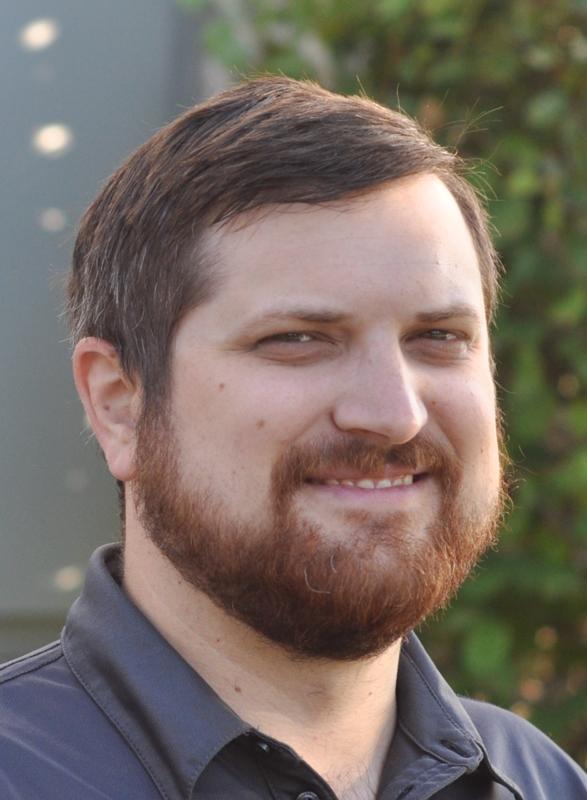 Even if FEA could demonstrate savings in materials these design rules are mandatory and must be followed. The shell thickness was set to the minimum required by the code for pressure requirements. No increase in thickness was required for the equator plates for leg support loads. However the top plate was made the same thickness as the bottom plate as an inexpensive method to reduce the amount of reinforcing required. We at Pressure Vessel Engineering Ltd are very grateful to Conrex for allowing us to post this experimental study. Conrex can be contacted at www.conrexsteel.com 416-747-4665 or sales@conrexsteel.com.